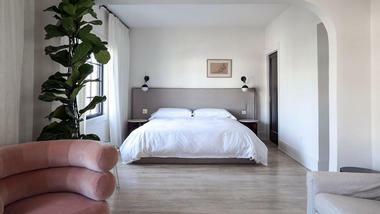 Hotel Covell is a unique boutique style hotel in Los Angeles, California. The motto at Hotel Covell leans toward quality over quantity as they strive to create an exceptional stay for every single guest staying under their roof. The suites are large and perfect for long term guests but short term guests are also welcome. Being conveniently located in Los Angeles on famed Hollywood Boulevard, Hotel Covell has quickly become a favorite for musicians, film and television actors, as well as producers and directors working in the area. The hotel is located just above Bar Covell, which is world-renowned. The rooftop sundeck makes for an added space for guests to use while staying at Hotel Covell, and enjoy at any time. Because there are only five suites in total, it is important for guests to reserve well ahead of time for their required dates. The small size should not be misleading--the size of the suites along with the amenities available make this one of Los Angeles’ best hotels. 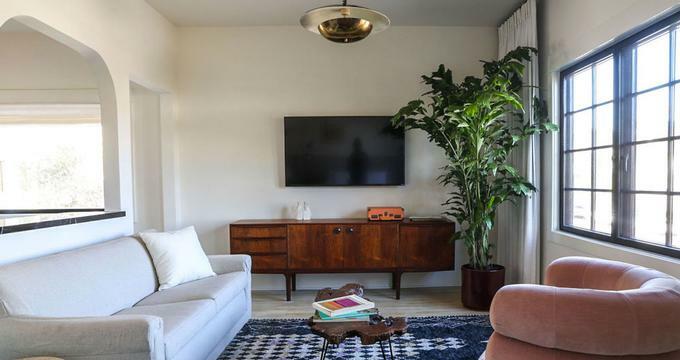 There are only five suites available at Hotel Covell, but the suites promise to be unlike most other suites in Los Angeles. They are perfect for guests looking for long term accommodations with plenty of amenities, including some that are very likely unique to Hotel Covell, to make this a true home away from home. 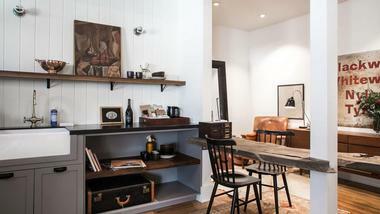 Chapter 1, or the Oklahoma Room boasts an American Mid-west theme with rustic finishes and earth tones. This room offers 375 square feet of living space which features a king size bed, a natural wood top dinette with two chairs and a full size retro Smeg refrigerator. Chapter 2, also called the 1950’s NYC Flat is inspired by the 1950’s feel in a New York City bachelor pad. The herringbone wooden floors give the suite clean lines and a roomy feel. There is a king size bed, central in the room, with a kitchenette, and a walk-in shower in the bathroom. 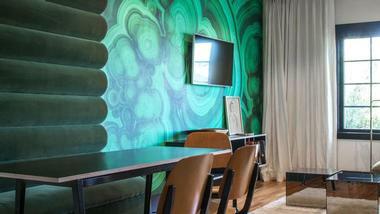 This suite also features a Smeg refrigerator and a record player for guests use with a complete vinyl collection. This suite offers a total of 315 square feet of living space. Chapter 3 is also known as A Parisian Atelier, with its Parisian inspired bohemian décor and soft tones and textures. The large, bright windows allow the light to spill into this suite, especially the bay window overlooking the Hollywood Hills. Within the 506 square feet of this suite, guests will find a king size bed, kitchenette and Smeg refrigerator, walk-in shower and a pull-out sofa for added sleeping space. Chapter 4 is a two bedroom master suite known as the Supreme. This suite is perfect for up to four guests. The two bedrooms are uniquely designed and provide great privacy for each guest. The common areas of the suite feature a kitchen area complete with counter top and sink, a bright sunroom, a dining area, and a living room. The bathroom is luxurious with a walk-in shower, and claw-foot soaker tub. For guests needing space to get work done, there is also a desk and chair. This suite offers guests 873 square feet of space to spread out and enjoy. Chapter 5 is the Heir, with a 1970’s vibe. It has a New York look with a French charm. This room is simple, yet functional with a king bed, a kitchenette and bathroom with a large shower featuring a sitting bench. The retro Smeg refrigerator can also be found in this suite. 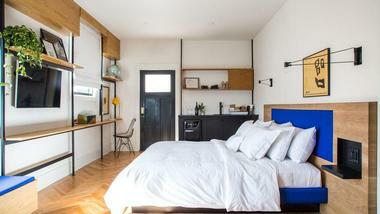 It is a smaller space, at 347 square feet, which would be suitable for a single or a couple to occupy. While there is not a restaurant on-site, guests staying at Hotel Covell will receive a 10% discount at any of the East Side Establishment restaurants simply by showing their room key. There are quite a few restaurants to choose from which qualify for this discount and they all feature delicious choices—something for everyone. The L&E Oyster Bar is a Los Angeles favorite and features premium oysters and a raw bar. There is an outdoor patio for airy dining and a unique experience and there is the upstairs area for drinking a glass of wine and enjoying the raw bar. They feature nightly specials which allows guests to try something new every night. Augustine is a wonderful place for wine lovers to dine and enjoy a great sampling of local wines while enjoying a meal fit for a fine dining establishment. The extensive wine and beer list will make it difficult to choose just one glass. The menu consists of tempting entrees such as Line Caught Salmon, Octopus Torta di Ceci, and Crispy Duck Confit. A highlight of their menu is the Cheese & Charcuterie combo plates where guests can create their own cheese plate to pair with whichever wine they have selected. El Condor offers guests delicious Mexican cuisine and cocktails. The open air patio is a great atmosphere for enjoying a fresh Mexica margarita. The menu consists of favorites like tacos, quesadillas, burritos, enchiladas, and even salads. This is a more casual dining option for those looking for a tasty dinner without all the fuss of a fine dining restaurant. There is no shortage of bars and lounges for guests at Hotel Covell to enjoy. The hotel itself is perched atop of the Bar Covell, which is very well known for their wine choice and hip, fresh vibe. It is a perfect spot for a date night or a group of friends gathering for good conversation and a few drinks. The dimly lit, rustic atmosphere is very relaxing and yet not too casual. They boast 150 wines by the glass, no wine list and eight beers on tap which they rotate to keep the selection fresh. The bartenders are very knowledgeable and can answer questions about the various selections. They do have a food menu to complement their drink menu including cheese plates and other small plate options. The proximity to Hotel Covell makes this a top choice for guests. There are other bars and lounges which are part of the East Establishments for which guests receive a 10% discount. The Hermosillo is a popular bar, even amongst locals, which has been built in a salvaged Mexican club. Beer drinkers will be in paradise with 18 beers on tap, which rotate to give a different choice often, including some of California’s finest. They feature tasty pub fare such as deep friend pickles or Brussel sprouts and offer a laid back, fun atmosphere. The Hi Hat is a new venue, which has been established inside an old bow and truss building made of red bricks with a distressed look about it. The space is wide open, once featuring many pool tables, but now home to live bands and space for dancing. It is a new hip spot for people to mingle, enjoy a drink and some good, live music in a comfortable, inviting space. Since Hotel Covell is a smaller, intimate hotel, there are no dedicated wedding at Bar Covell to host private functions or parties at the Side Bar. 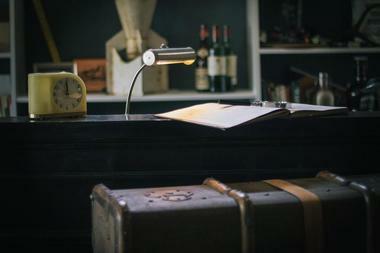 The Side Bar is accessed behind a secret bookcase, which only adds to the charm and mystique. It can accommodate up to 50 guests for birthday parties, engagement parties, work gatherings and more. It has the same laid back, casual vibe as Bar Covell. There are catering options available as well as the full menu. Large platters can be made to serve buffet style. The Side Bar can be reserved seven days a week from 11 a.m. to 12 a.m. Sunday to Thursday and 11 a.m. to 2 a.m. Friday and Saturday. Another option for events is the private sun deck at Hotel Covell, which can be transformed into a rooftop event space. A full bar service can be set up to accommodate the event. The amazing views over Hollywood Boulevard make for a memorable occasion. It can host up to 75 guests with 1200 square feet of space. Since there is not a spa located at Hotel Covell, guests will have to venture out in the area to enjoy pampering. This is not difficult since Bliss Spa is located just a short distance away on Hollywood Boulevard. At Bliss Spa guests can indulge in facials, massages, pedicures and more. Their rooftop cabana is the perfect setting to relax and receive a massage while overlooking the city. This spa features over 6000 square feet, including seven treatment rooms, lockers for men and women, a brownie buffet bar and a retail shop. The atmosphere is unlike many spas, which feature calming, Zen aromas and music. At Bliss Spa guests will enjoy some good old rhythm and blues music and a fun, upbeat atmosphere. The treatments themselves are relaxing and indulgent but there is no need to feel uptight while roaming the halls and sitting in the lounge. Despite Hotel Covell being located in a convenient downtown setting, a golf course for the golf lover, is only a short 8 to 10 minute drive away. The Los Feliz Municipal Golf Course is a popular course amongst guests and locals alike. Some may recognize this course from the movie “Swingers”, which is part of its popularity. It is a simple 9 hole hole, par 3 course with tree lined fairways and beautiful greenery. Some of the holes offer a bit of a challenge being on a slope. The price is very affordable and the course makes for an enjoyable, entertaining round of golf while visiting downtown Los Angeles. Since Hotel Covell is more like an apartment complex, there is no 24 hour concierge. There is reception available from 8 a.m. to 6 p.m. daily with a number left with guests in case of emergency. The day before arrival, guests receive a text message to confirm their stay details and ensure there are no changes. Upon arrival at Hotel Covell, guests are personally greeted by a staff member and given a personal tour of their suite and the hotel. Cars can be valet parked in the complementary hotel parking lot. For guests use only, the private sun deck is a wonderful and relaxing place to enjoy a morning cup of coffee or an afternoon book. There are outdoor couches, chairs and ottomans for the utmost comfort. There are even small patio heaters should the air be a little chilly. Guests are always treated like family at Hotel Covell since it is a smaller, more intimate hotel. Back to: Weekend Getaways from San Diego, California and 25 Best Romantic Things to Do in Los Angeles.